It was hard to snap myself out of my macaron baking frenzy. But then I realised, there has not been anywhere near enough scones around here lately! 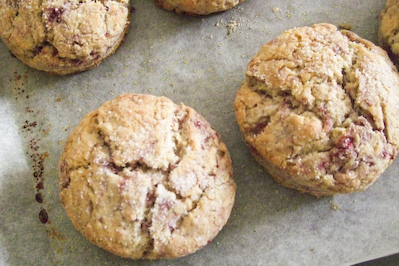 So why not another scone recipe, before everyone forgets that I'm the scone-mad girl who eats them for dinner. Not that I ate these for dinner, but they were really good and it was a tempting thought! There's something so relaxing and comforting when I go back to baking scones, no matter how bad my day/night/week/month has been everything feels better when I'm covered in flour and the smell of them baking in the oven permeates through the house. 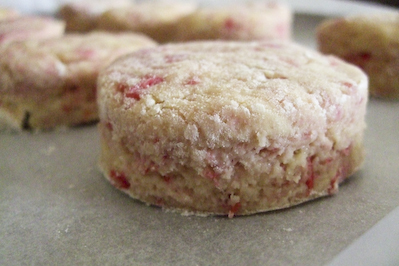 The raspberries in these gives them a wonderful pink tinge of colour, I seem to be baking a lot of pink things lately. The cream cheese makes them extremely moist and rich (and is a useful way of using up leftover cream cheese if you just made a coffee crunch cake) and were just perfect with some of the homemade lemon marmalade I had in my fridge (thanks Tomred!). These were not too sweet but had a lovely crunchy sugar top, with a hint of tartness from the berries, more like richer, eggy, cake-like scones than the fluffy cream scones I've been making recently. To be honest I still can't decide which I prefer! Preheat oven to 200 degrees C. Carefully stir cream cheese, milk and egg in a medium bowl until combined. Sift flour, baking powder, salt and sugar in a large mixing bowl and then rub cold butter into the dry ingredients until the mixture resembles fine crumbs. 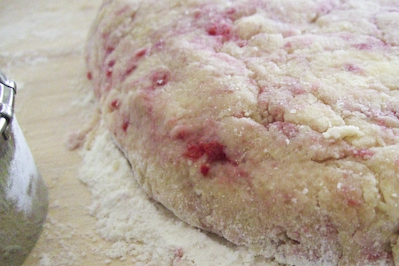 Form a well in the centre of the crumbs and add the wet mixture plus the raspberries to the bowl. 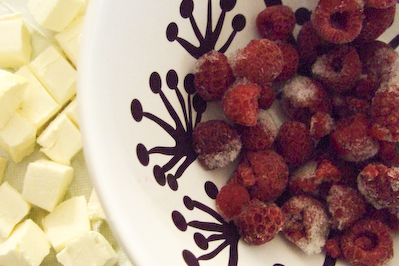 Carefully and quickly mix together, avoid crushing the raspberries too much. Gather dough together with well floured hands and pat into a 1 inch thick circle on a well floured surface. Cut dough using a 5cm scone cutter (any round, thin rimmed, floured water glass will work as a substitute), and place on a line baking tray. 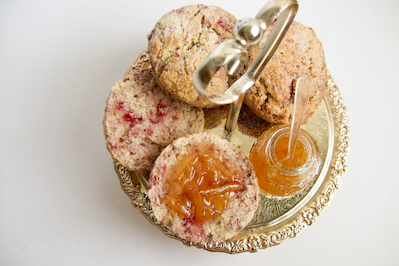 Carefully pat together any of the scraps to recut, but do not overwork the dough or the scones will be tough. 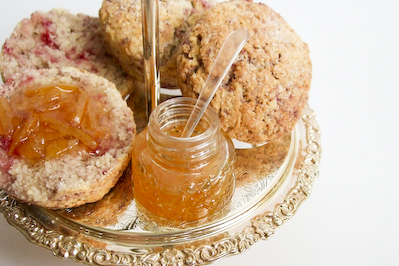 Sprinkle tops of scones with sugar and then bake in oven for about 20 minutes or until golden and cooked through. Serve on their own, or with fresh cream and/or jam. Aww Steph these look so sophisticated and awesome!!! And I love your serving platter! Love the sugared tops on these, they look really good! 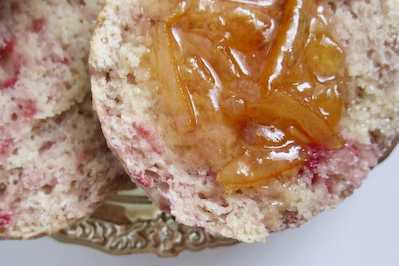 I have lots of tasty jam in my kitchen, but a severe lack of scones or the energy to make them. Toast just isn't going to cut it after looking at these. I have never made scones... I think it's about time. Lovely flavours!! Yum! I knew it was only a matter of time before you baked more scones :) I really love the idea of adding cream cheese to them. I'll have to give it a try soon. They look great Steph! I think it is wonderful that you used raspberries - was a great idea! so pretty! love the pinkness! OMG! I love your stand! So pretty... 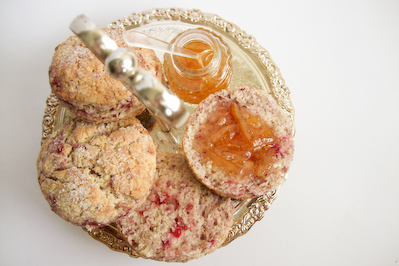 I think you might have just inspired me to make my own scones... these sound delicious! Lorraine - Heehee thanks! It's actually a condiments tray but it was too cute not to use! Conor - They were the best! Oooh you can always buy the woolworths ones, they are surprisingly decent! Ellie - Ohh you have to try making them sometime! You would make beautiful scones I'm sure. Lisa - hehe I know I'm such an addict right? Yay try them! chocolatesuze - hee hee thanks! me too! Betty - yay! I can't wait to see how yours turn out!